Come on, you know the drill: on the double! …O come on, we all know why we´re here. If you´ve gotten this far in the story you should at least have a faintly divine guess as to what´s going on right now. That´s right – we´re in Jerte, to see the cherry blossoms but Huckleberry just – woops! bloody mud – just ran off straight up the terraced mountain side without any consideration for our voyeuristic pleasures. By the way this whole mountain range encased valley reminds me of a really, really poor Telludride, Colorado. Without the ski/sky resorts. Here, brace the outer edge of your left foot on that rockface and now pretend your just walking along the wall´s face one foot in front of the other to step Yep! that´s it. Ok.
Where´d he go? Let´s follow that curving path beyond the second cherry tree terrace on the left, just in front of that county house shack thing where a grower probably houses tools and other inanimates. Yeah, the one that curves over the gushing mountain stream coming down the bladed and greeny lusciousness known well to all laid heads who´ve dreamt days at a time under nimbus nines and cummulus elysiums. Today, dreams accumulating rain. Luckily we have this umbrella to share. This is the weather that pursues Arthur´s knights in their finest valiance. In the deepest, darkest, giraffest neck of the woods. 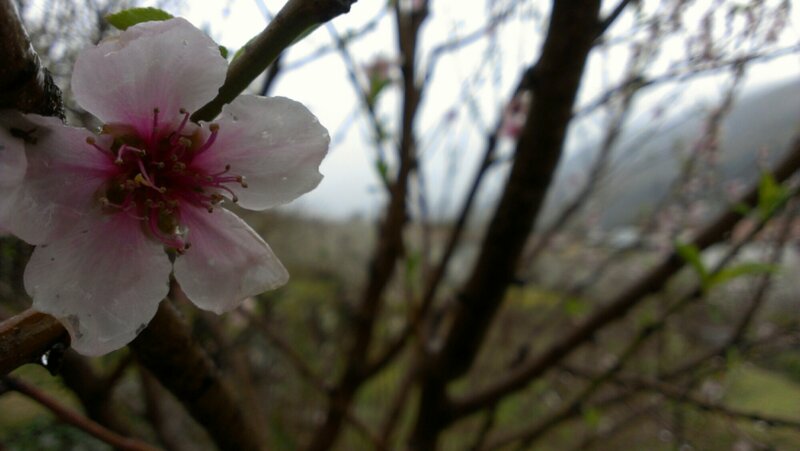 What fog and slumber overcomes the ridge; but these blossoms brighten the damp view. Dressed to kill, these cherry trees are. How beautiful, twenty minutes of non-stop flutter-white petals hitting the retina like the rain drops hitting that small placid pond beyond the tool shed. And so warps your inner vision, pitter-pattered and ringly patterned. Boy is it cold. Could we exchange mittens? Mine I mean yours look so damn cold, maybe you´d like to switch up for a bit. He doesn´t seem to be doing much, does he? All this talk about one day getting to the Valley of Jerte to see cherry blossoms and there he goes just standing there. That´s quite the smile though. Wonder what he´s looking at. Wonder where he´s looking from. Have you ever kept a promise? Not one of those silly but equally important promises but one of those equally important but sillier promises. So silly it might take weeks, months or years to see fruition? So silly you might travel across oceans and continents to spend a moment listening? I bet you have. At least once. If that´s the case, then you know precisely what´s going on right now. Why don´t we give him some space, and do as he´d like us to do? Yeah, you and me Dear Readers, let´s just take a stroll through this ultra-lush, rainy, cherry blossoming valley and enjoy our wordless selves and selfless worlds. This doesn´t appear to be a time for any sort of vanity, worrying, complaining, or pre-occu-paining. Let´s get on with appreciating. I´m sure we´ll catch up with Huckleberry in a bit.